Russian government investigators are focusing on a tiny, little known Latvian bank through which Oleg Deripaska (front) has been holding and moving billions of dollars. The Latvian Trade Bank (LTB), as it was known for many years, has recently been renamed Expobank, after it was taken over by Igor Kim, who bought the bank from Alexander Mamut (left). The bank was a target of investigation by lawyers for Roman Abramovich and Boris Berezovsky, as they prepared for their recent trial in the UK High Court. Its money-laundering business became public during the witness testimony at the trial last October and November. At one point, the bank’s management agreed to submit to the UK court’s jurisdiction and accept a court order to disclose its transaction records. 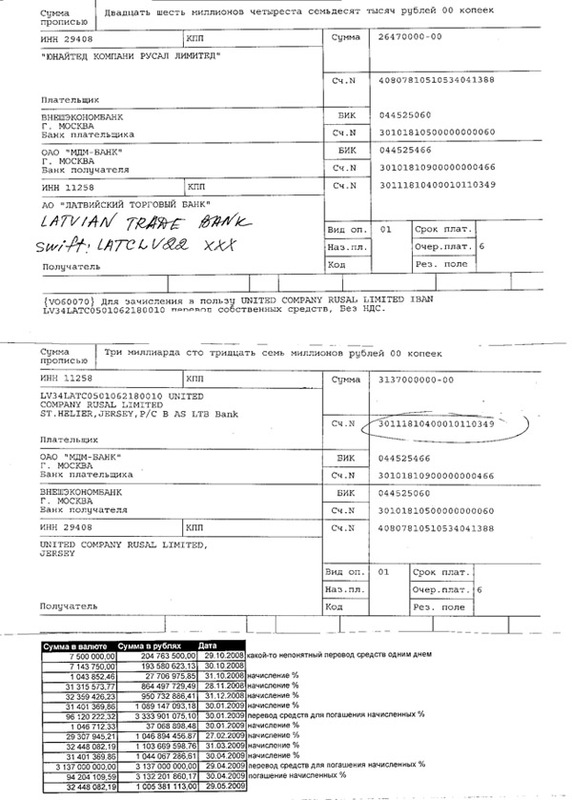 Evidence that the Latvian Trade Bank was a conduit for payments from Abramovich to Berezovsky was admitted by Abramovich during his testimony on November 2,3, and 7, 2011. Abramovich acknowledged that Sibneft had used the Latvian money box for supplier payments; that he used the bank himself to hold money for front companies called Pex Trade Corporation, Espat, Madison, Palmtex and Runicom; that instalments of a $1.3 billion payoff to Berezovsky and Badri Patarkatsishvili went through LTB; and that $164 million Abramovich paid Berezovsky to buy his shares in the television company ORT went through LTD.
“Q. Mr Marino’s evidence is that ‘the Sheikh did not actually commit to being involved in the transaction until on or about 29 May 2001’. The Devonia Agreement itself was said to have been ‘executed on 12 June 2001’. However, as is apparent from Ms Panchenko’s schedule of payments [which he exhibits], the first instalment of the US$1.3 billion payment… was made on 31 May… to the designated account at Latvian Trade Bank, with the instruction for that payment having been delivered on 22 May 2001…” In other words, Mr Abramovich, Mr Mitchard was relying on the date of a document that we now know to have been entirely fictitious. A. Do I have to confirm? Sorry, what do I have to do? Q. Well, do you want to comment on that? Abramovich and Berezovsky weren’t the only Russians to use LTB for sham transfer schemes. Oleg Deripaska has used the bank to hold and pass through money for dozens of affiliated trading companies of the Rusal group. Investigation of these Rusal’s trading schemes has been under way by the Accounting Chamber in Moscow since July. Investigations of the role LTB has played in Rusal’s cash pipeline are also about to surface in two London court cases – Michael Cherney’s case against Deripaska, which will resume in the High Court on September 27; and Victor Vekselberg’s case against Deripaska in the London Court of International Arbitration, currently proceeding behind closed doors. The LTB records are evidence for the Accounting Chamber investigation of the legality of tolling by Deripaska, because they suggest that dozens of companies supplying alumina for Rusal smelters in Russia to turn into aluminium were owned by Rusal, and thus part, not of a legal tolling chain, but of a tax-dodging transfer pricing chain. The names of these companies and LTB account-holders is legion, and they are also surfacing in separate litigation under way in the Cyprus courts – Alumina & Bauxite Management Ltd, Alumina & Bauxite Trade Ltd, Alumina Trade Co Ltd, Bauxite & Alumina Mining Venture Ltd, Bauxite & Alumina trade Ltd, Trade Bauxite & Alumina Ltd, etc. 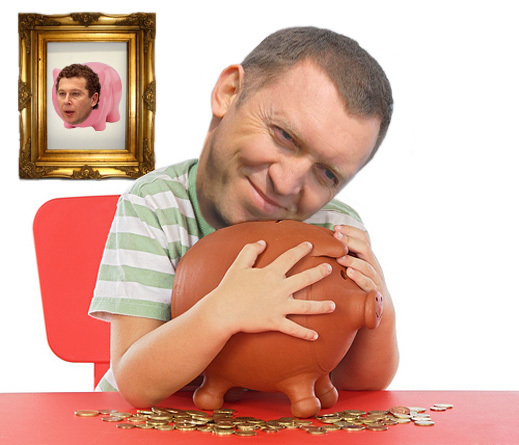 But the transaction record for Deripaska’s piggy bank was set in October 2008. That’s when the state bailout bank in Moscow, Vnesheconombank (VEB), wired Rusal $4.5 billion to stave off its bankruptcy and meet the loan repayment demand of an international bank consortium, which earlier that same year had funded Deripaska’s purchase of Mikhail Prokhorov’s 25% shareholding in Norilsk Nickel. Here’s Rusal with its hand out for the VEB bailout. And here’s the payment record, recording the money leaving VEB, going to MDM Bank, and then on to Latvian Trade Bank, where Rusal’s Jersey-registered holding kept its account, IBAN No. LV34LATC0501062180010. Why would a multinational corporation of such size operate accounts in a bank with minuscule capital and reserves ($24 million, according to the 2011 financial report); negligible profit (about $750,000), and less than 80 employees, including coffee carriers and cleaners? What fiscal prudence would have warranted placing billions of dollars in care of such a dwarf? The practical answer is that the trolls in LTB’s Riga office did little more than move pieces of paper, and never had the bank’s hands on the money for long. A theoretical answer, according to an expert on Russian banking operations abroad, is that a Russian-owned bank in a European Union member state like Latvia makes it possible to hide cashflows in plain sight, in a bank that has been watched by the money-laundering authorities of the US and the European Union with less keenness than the banks of the haven states in the Caribbean and Central America. Risk and recourse between the bank and depositors like Abramovich and Deripaska have also depended on their relationship with the owners of MDM and LTB – Popov, Mamut, and now Kim. At least theoretically, Deripaska can rely on them to keep concealed many of the aluminium trade volume and pricing details that he doesn’t disclose to his creditor banks, and keeps secret from his fellow shareholders as well.